This book, first published in 1983 with a second edition in 1992, investigates the emergence of the sociology of knowledge in Germany in the critical period from 1918 to 1933. These years witnessed the development of distinctive paradigms centred on the works of Max Scheler, Georg Lukács and Karl Mannheim. Each theorist sought to confront the base-superstructure models of the relationship between knowledge and society, which originated in Orthodox Marxism. 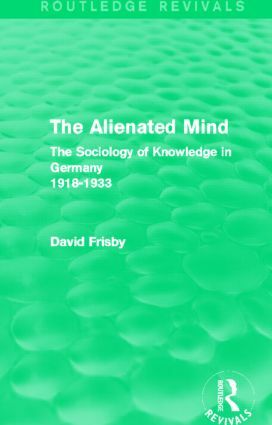 David Frisbsy illustrates how these and other themes in the sociology of knowledge were contested through a detailed account of the central sociological debates in Weimar Germany. This reissue of The Alienated Mind will be of particular interest to students and academics concerned with the development of an important tradition in the sociology of knowledge and culture, social theory and German history.